Shopping for the best drill could be a daunting task especially when there are a number of good drills/drivers in the market today. It’s also challenging if you have never purchased any type of drill before. These days, drills come in all shapes and sizes, features and benefits. It takes a good eye to weed the best ones out of the regular drills so you can work on any kind of project in a more efficient manner. Here is a guide to help you find that quality drill for the best price. I hope you’ll find this review useful. Whether you are a homeowner or a contractor you need the best power drill/drivers money can buy. Only quality drills or drivers will yield quality results. And now that there are more features in an average drill, it could be hard to look for the best tool that will work for your needs. 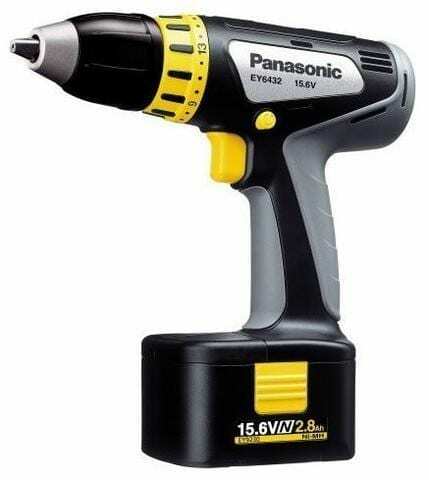 The Panasonic EY6407 ranks as one of the best power drill and driver. It is a cordless high performance drill that comes with two 3.0 amp NiMH battery. It has a compact design with easy controls. It is also one of the lightest (without the batteries) weighing only 3.9 pounds. This power drill provides maximum 293 in/lbs. of torque and will get jobs done with utmost precision. 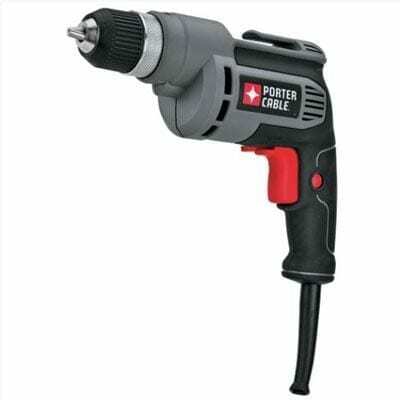 The Porter-Cable PC600D is a corded drill with variable speed. It comes with a powerful 6.0 amp motor to provide utmost precision and efficiency in any demanding job. This drill has a keyless 3/8-inch chuck which will let you change bits easy. It’s an ideal tool for drilling and driving because of its variable speed trigger. This Porter-Cable drill has a unique lock-in button to let the drill run continuously even without holding the trigger. 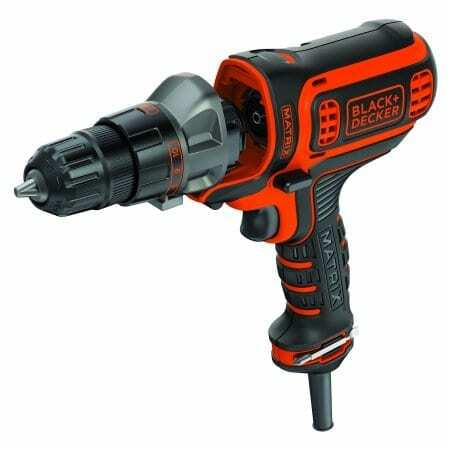 The Black & Decker BDEDMT is a corded drill/driver with the exclusive Matrix Quick Connect System. You don’t need a tool to remove and set a new tip; all you need to is to remove the application and then place a new one in a snap. Drilling and driving comes easy even in confined spaces because this tool is lightweight and compact. A power drill/driver is a staple tool in a tool box or shed. If you are passionate about DIY then you need a quality and reliable drill for drilling holes, driving screws and bolts and with the right bit, you can use a drill/driver for finishing, cutting, sanding and rotating. This is an indispensable tool in a home or shed. If you are someone who wants to indulge in woodworking then a reliable drill/driver should be your choice. Woodworking is not just about talent or interest but the outcome of any project relies on tools and equipment. Investing on a quality power drill and driver will help you finish projects with ease and plan for more projects in the future. Finally, if you are a contractor or a professional then you also need a reliable and quality drill/driver. You rely on your tools in your everyday work so it makes good sense that you invest in the best tools in the market. Purchasing the most efficient drill/driver with the attachments or bits that you really need for work is something that you must never overlook. You need a power drill/driver to get driving and drilling jobs done fast and easy. It could take a lot of time to manually drive a screw or a bolt or to sand or finish surfaces. You will only end up with an aching hand and arm if you manually perform these jobs. A power drill/driver takes these jobs easy, driving screws and bolts in seconds and power sanding or finishing surfaces fast so you can do more jobs in one time. Hand, arm and shoulder pain ensues if you don’t use the right tools for the job. A power drill/driver will reduce these worries and prevent any stress or pain along the hands and arms. There are even drills and drivers with special ergonomic features, updated grips and handles and even lock-in triggers to reduce hand and arm pain. Drills and drivers are fast and easy. You will save a lot of time instead of manually doing all kinds of projects. And with more time in your hands, you can perform other tasks as well. Power drills and drivers now have convenient features that allow users to do a variety of tasks like sanding, finishing, cutting and sawing. There are even drills that can work as a trim saw, as an oscillating tool, a router tool, a jigsaw and sander with the right attachment. Take note of the following drill/driver features to be able to make an excellent decision. Motor capacity - a drill/driver’s motor capacity basically says everything about the tool. The higher its capacity, the stronger the motor, the better it could handle drilling and driving jobs. Usually drills that have multiple functions have a higher motor capacity while industrial and commercial drills have higher motor capacities than hobby drills and personal use drills and shop drills. Variable speed – a drill’s variable speed allows you to adjust it according to your needs. You can do tasks more efficiently when you use a variable speed drill. Dimensions and weight – the drill’s size and weight will determine if it’s compact and easy to handle. It has to have an easy grip/ handle with easy but safe trigger. The weight must be bearable especially if you plan to use the tool constantly. Most corded power drills are lighter compared to cordless drills because the tool’s battery often adds to the weight. Easy change attachments, keyless change – there are a lot to explore in this area! There are drills or drivers that still use tools to remove the bit and to reattach a new attachment for a new application while there are drivers that offer keyless, tool-less attachment changes so you can seamlessly move from one project to another. Special features – there are a lot of new and exclusive features to watch out for. Some drills/drivers have lock-in features to let you lock the tool for continuous use. There are drills with quick connect attachments; no need to use a tool to change from one tool to another. Still there are drivers with LED lights to let you work even in low lighting and features that let you use the tool even in tight spaces. Corded or cordless – there are users that prefer corded drills rather than cordless ones for uninterrupted power. Cordless drills are definitely handy and efficient but it won’t take long till their batteries dry out. But the choice is yours; cordless or corded drills for your projects? Warranty – most drills are covered with a two-year warranty and basically, the more the better right? Definitely you need a longer warranty if you are going to regularly use this tool. You may also purchase extended warranties which are available from the manufacturer or from the store where you purchased the tool. Price – an expensive drill is not always the best option; there is a lot of amazing quality drills/drivers available for the least price. You just need to keep your eyes open. Take note of special occasions and shopping events that will let you purchase your choice of drill at a discounted price. Great shopping events to watch out for are Cyber Monday and Black Friday where most power tools, especially power drills are available for a fraction of its original price. The Panasonic EY6407NQKW is a cordless power drill and driver that has a powerful motor and electronic speed controls. It’s a 12-volt drill that provides full torque no matter how fast the drill is going. It has a ½ chuck that can take big bits which is unlike any other 12-volt drills in the market. It has a rubber handle for a comfortable, non-slip grip as well as a forward/revers switch near the trigger. This drill is ergonomically designed for top performance in all kinds of jobs. This drill is has a compact design making it a great choice for any kind of project. You can drill with utmost precision because you can hold the drill firmly and completely with your hands. A compact design is also important when you want to sand, drive or cut materials. With a firm grip on the handle, the drill won’t move unnecessarily and errors are far from ever happening. You need a lightweight drill to do almost all jobs that require constant tool use. A lightweight drill such as this Panasonic drill won’t strain your hands and upper arms and will allow you to move freely too. Any strain or pain could cost the outcome of your project. And of course you won’t feel tired and you will be ready for your next project soon. More power equals quicker turnaround times for any job. You can count on this driver/drill in tough projects and in equally tough situations as well. This drill will handle larger attachments which most drills of its kind will be unable to use. Changing attachments is also easy and won’t take too much of your time. You can move from one project to another easily. The handle of the Panasonic EY6407NQKW is comfortable and won’t strain your hands even if you use if for a long period of time. The easy grip handle will also protect you from slips and reduce vibrations. The Porter-Cable PC600D is a variable speed drill that has a 6.0 amp motor which offers pure power especially during tough situations. It has a keyless 3/8 chuck that lets you change attachments easily, no tools required. It has a variable speed trigger that lets you choose from 0 to 2500 RPM so you get the best drilling and driving results all the time. A unique lock-in button will let you use the drill continuously without ever pulling the trigger or your hands on the trigger anymore. This drill is one of the lightest at 4 pounds and will get the job done like any regular-sized drills and drivers. This Porter-Cable drill is one of the strongest with a 6.0 motor. It will work for all kinds of projects and will get the job done fast. The powerful motor also allows you to use this drill for many applications, just choose the attachment that you need and you are good to go. No need to use a tool or a key to remove the bit off the chuck of this drill. It is very easy to load a new attachment and is also easy to remove it. You will save time and will be able to finish more projects when you got this tool to use. This drill/driver has a variable speed trigger to let you select the ideal speed to work on a particular project. Definitely precision counts in everything you do and fine tuning the speed of your drill/ driver will let you get the best results. This feature is very convenient if you need to leave your grip and let the drill run continuously. This works perfectly when you need to drill deeper and longer while maintaining a good handle on the drill. You will also find his useful when you are sanding, cutting or sawing. A drill should be powerful and at the same time compact and lightweight. A lightweight drill will be easy to carry, use and to take anywhere. You won’t need to strain your hands; arms and shoulders just to pick up a drill and in this way you get more jobs done as well. The Black & Decker BDEDMT is a drill/driver with a very unusual feature. It is part of the Matrix Quick Connect System that will let you change attachments easy without the use of a tool or key. This drill comes with a set of attachments that will turn a drill into an impact driver, an oscillating multi-tool, a jigsaw, a detail sander, a router and a trim saw. This drill also has a powerful 4.0 amp motor and an 11-position clutch for different control levels. It is also lightweight, compact and easy to use even in confined spaces. The Matrix Quick Connect System is a unique feature of Black & Decker drills/drivers that lets attachment and tool changes be simpler than ever before. You can change the tool or attachment in just a few seconds. Just remove the current tool and replace it with the tool of your choice; you won’t need to use a tool or a key to do it. You will be able to quickly and seamlessly transition from one project to another in seconds with the Matrix Quick Connect. This tool has a strong 4.0 amp motor that lets you get countless jobs done fast. You need a strong and durable motor that will withstand different applications and with this drill which can transition from one tool to another, you definitely need a strong motor to support different attachments. You can choose from 11 different levels of control for your projects. You can sand, strip, drill or drive confidently and efficiently when you fine tune your speed. The Black & Decker has an easy grip compact design that will let you use it without breaking your arm and hand. The grip is also specially grooved and marked so you get an excellent handle on the tool in any situation. This drill is lightweight and is even one of the most hardworking drills despite its size and weight. Some want corded drills while some prefer cordless drills and this Black & Decker drill is corded to ensure that you get full, uninterrupted power as you do all kinds of projects. You won’t have to worry about running out of juice or recharging your unit when you got a reliable corded driver/drill to use. The Milwaukee 2407-20 drill could be an excellent addition to your tool collection at home or in the field. This drill is an M12 3/8 drill driver that has a strong and secure grip to let you work on any kind of project at home or at work. It has a compact design and is very durable. Just look at how it is constructed. You will find that this tool has a solid construction without any moving parts that will cause unnecessary noise or vibrations. This tool may just be the power drill/driver you have been looking for. This drill is a traditional drill; what you see is what you get with no frills or fuss which will only complicate its use. It is designed to be simple and not too fancy for beginners and will never be too complicated for contractors and professionals. This drill is among the lightest weighing only 3.2 pounds. Therefore you can use it no matter how long or how intricate your work is. And because it’s lightweight, you can transition from drilling or driving to other jobs to complete your project fast. You minimize fatigue and thus you will be ready to do more. Just check out how this drill looks like. The grip just slightly leans to provide the best angle for drilling and driving. The grip is also soft to provide a cushion for a comfortable grip but not too soft to let the drill slip. This soft grip also provides optimum control so you get less vibrations and unnecessary sound when you use it. Again, just looking at this drill will prove how durable and how compact it is. No moving parts and no hanging or protruding parts to cause vibration and sound. It is made of hard plastic and metal with a very durable chuck. This makes this drill the ideal drill to use for years to come. 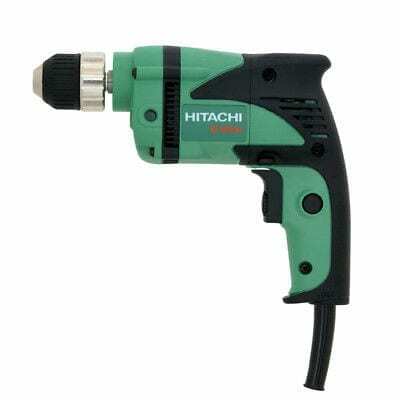 The Hitachi D10VH is a corded drill with a 6.0 motor. This drill is a reversible driver drill that combines speed and torque to produce top power. It has a maximum torque of 108.1 in/lbs. and is ideal for high speed projects and applications. It has an ergonomic form palm grip that allows you to hold the drill securely. It has a variable speed dial which is conveniently located near the trigger. Weighing only 3.1 pounds, this is one of the lightest drills and drivers that you may have ever used. The Hitachi D10VH has one of the strongest motors of all at 6 amps providing the most torque for a small device. A powerful motor means you can do almost any kind of project and you won’t have to deal with pauses and stops that will only delay your project. The powerful motor also lets you work with this drill for years and years to come. Drill or drive with confidence with maximum torque to back you up. You will be able to conquer any kind of demands in your project and complete it at the best time too. It has a soft and secure grip to let you hold on to the driver/drill for maximum control. There will be no moving and no unnecessary vibrations that can affect the outcome of your project with this tool in use. Choose the appropriate speed for your kind of work. This drill will let you perform with maximum efficiency. Drill, drive, sand and cut with this drill with utmost precision with its variable speed dial. This drill is also one of the lightest at 3.1 pounds, you can take it anywhere and use if for any project minus the strain and pain of carrying a heavy drill or tool. It is also the ideal tool that you can use in tight corners and spaces since it has a compact design and is non-bulky. You can take it anywhere inside a tool box or bag. This is one of the most versatile tools because of its tough and durable motor and maximum torque. Tool and attachments are easy to change and connect even anyone new to using a power drill will easily understand. I was also amazed at how many people found this drill the best drill for different applications. The fact that this drill is the most expensive in the list, it has still gathered a perfect score and a lot of positive reviews from customers. Most that have used this drill say that it is the best power tool that they have ever owned and remarked at how easy it was to use. Most also agreed that the Panasonic EY6407NQKW is one of the best cordless drill and will never trade it for any cheaper brand. But despite being affordable, the Black & Decker has also gathered a lot of positive reviews with a near perfect rating on Amazon. Those that have used this drill agree that it was the best drill for the money. Many though that the Matrix Quick Connect System was the best thing that ever happened to changing attachments in drills and drivers. However, there were some who were not too convinced since the basic Black & Decker drill only came with basic screw driver attachment. They had to pay additional to get other tools or attachments for their drill. And of all the drills mentioned in this review, the Hitachi had the least positive reviews with people remarking that it did not live up to their expectations. Some said that it was an OK drill but were not too excited. This Black & Decker is a compact and lightweight tool best for drilling and driving in compact and tight spaces. It offers 0 – 650 RPM with up to 115 in/lbs. torque. Its clutch is capable of 11 positions making it a good tool to use for tough projects and jobs. This is a bare tool only and you need to purchase attachments and batteries for this cordless drill. The DeWalt DC970K is a compact 18-volt drill and driver that comes in a kit. It is ergonomically designed to minimize user fatigue with dual speed range and compact size. The kit contains two batteries, one hour charger, a kit box and a double-ended screwdriver. It will work even in the toughest conditions and will change attachments and bit with its ½ -inch single sleeve key-less chuck with a tighter and better grip. This is a high performance drill with a motor that delivers maximum power of 380 units watts out. 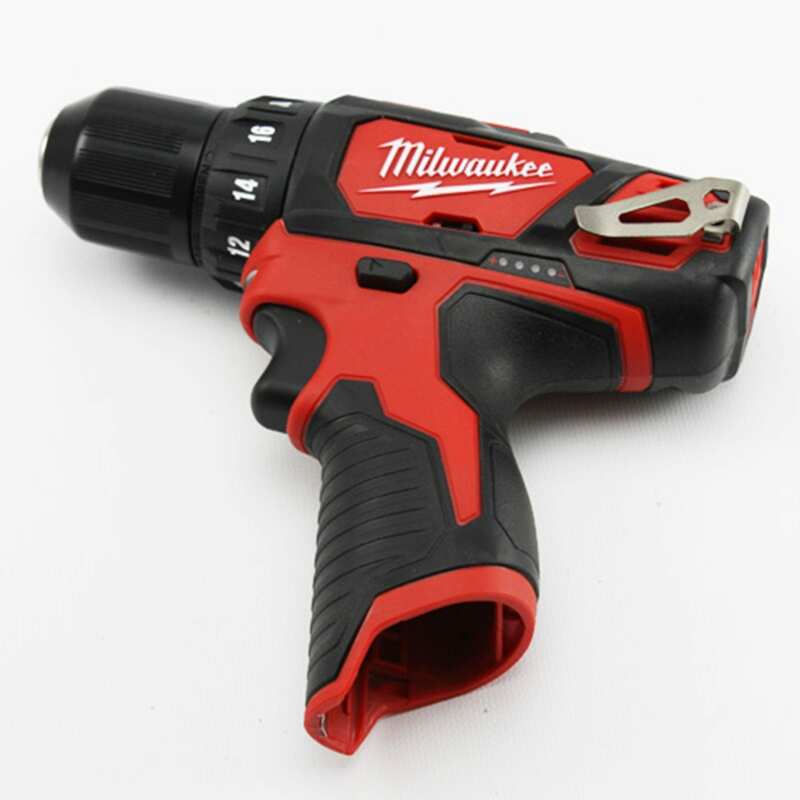 The Milwaukee 2416 is a cordless drill/driver which is very easy to use. It is tough for all kinds of applications; it is durable and has a compact and easy to use design. This is only a bare tool. Accessories and extra batteries should be purchased separately. There are a lot of power drills and drivers around but you need to prioritize quality above everything else. This review has revealed that the Panasonic EY6407NQKW 12 Volt, 1/2-Inch Cordless Hyperformance Drill Kit is the best drill/driver around. There are a few reasons why. The tool shows top quality when it comes to overall construction, design, performance and reviews. Social media presence also showed many users prefer this Panasonic drill/driver above all other drills in the market. It was preferred by many because it has a reliable motor, efficient torque to work for a lot of home and commercial applications and is easy to use. The design of the Panasonic EY6407NQKW is compact and perfect for outdoor rugged use. It is also lightweight making it ideal for people who are new to using power tools. Professionals and contractors will also love this power drill because of its features, design, weight and performance. It is certainly more expensive than other drivers/drills but to most people who have used it, the price is definitely worth it. There first runner up has to be the Black & Decker BDEDMT Matrix which is part of the Black & Decker Matrix Quick Change System. The easy change system was certainly something new and has also captured the attention of many users and pros. Certainly one of the drawbacks of using traditional drills was changing the tip or the attachment and this Black & Decker drill was a breath of fresh air. Those who wish to shop for the best drills and drivers need to be cautious. Not all brands that claim quality have quality products. Make sure to read reviews and be wary of claims. You can save a lot of money, time and effort when you check each product and compare them side by side. For those interested in purchasing the Panasonic EY6407NQKW 12 Volt, 1/2-Inch Cordless Hyperformance Drill Kit may click here to get started.